Salzkammergut, Bad Ischl, Austria, 1951. The Seventh Jamboree, 12,884 Scouts. Simplicity the keynote of the Jamboree. Seven towers erected, each stood from one of the Jamborees beginning with Olympia. As the name of each was announced, a flag was broken on the tower and the song of its jamboree sung. The jamboree of simplicity. 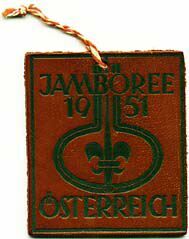 First time German Scouts were able to take part in a World Jamboree as full members of the World Brotherhood. One Scout from Japan; he knew no language other than his own and the word "Jamboree", yet he safely made the flight until the sight of Scouts waving Japanese flags at the Austrian airfield told himthat he had reached the right place.